I want to buy some varieties that are listed on the website, but I can’t find them at my local garden center. Can I buy them directly? My Tried & True Edible plant came in a biodegradable pot. What is it made from and what are benefits of this type of container? What is the best way to plant my Tried & True Edible? I had a nice lettuce crop this spring, but the weather is too hot for another lettuce crop now. After pulling up the lettuce, I don’t want to leave the space empty. What should I plant now? I live in a place where our growing season is really short. Can I do succession planting? Can rotating my crops help my garden? My garden is very small, so I don’t have space to rotate crops. Will my garden still do well? When and how can I add organic matter to my garden? What is the best way to fertilize my vegetable that I am growing in containers? Can weeds go into the compost pile? What are some suggested organic matter for my compost? What does finish compost look like? I usually water every night with a hose, but I find my plants are wilting. What’s causing this? What’s the general rule about watering? What’s the best way to keep aphids and spider mites off my plants besides insecticides? I want to buy some varieties that are listed on the website, but I can’t find them at my local garden center. Can I buy them directly from you? Unfortunately not, we are a wholesale grower/company and we sell our transplants to distributors, greenhouses, nurseries, and retail garden centers. Please find a retail garden center near you listed in the RETAILER tab of the website. You may have to ask your local garden center that you frequent to contact us about carrying Tried & True Edibles. The wrapper and pot are 100% biodegradable. The wrapper is made of starch and corn and can be recycled or composted. The plantable pot is made of a mixture of wood fiber and peat moss. The plant and the pot can be planted right in the ground lessening transplant stress because the roots are not disturbed. The added benefit is no plastic goes to the landfill. Our Tried & True Edibles plant tags contain a high content of recycled material, are printed with vegetable-based inks and can be recycled in municipal or community recycling programs. Please note: Don’t mind the distinctive appearance of our plantable pot as you are observing the biodegradable process in action. It is completely harmless and is beneficial to the soil. Before planting, water the plant, pot and ground thoroughly. Carefully cut off recyclable wrapper around the pot. Tear off the rim and the bottom portion of the pot. These pieces can be torn up and placed in the planting hole or mixed in the soil. Plant pot so the root ball is even with the ground. 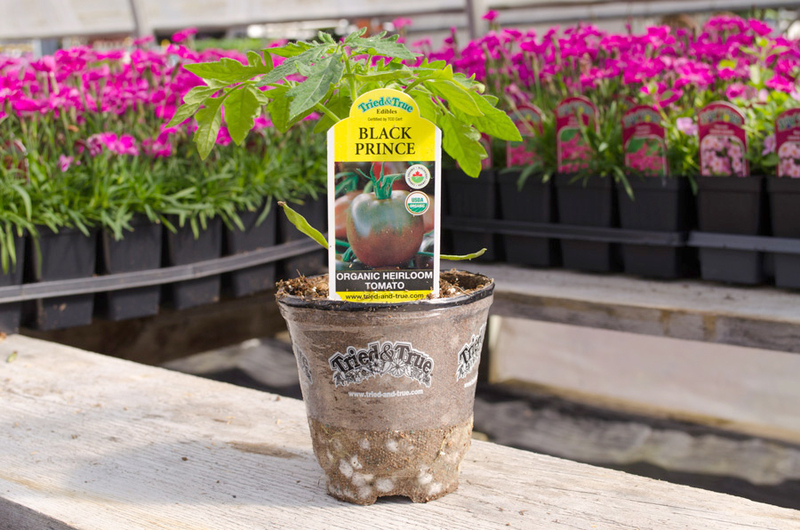 Bury tomato plants deeper (at least 2/3 of plant and remember to remove lower leaves) to promote better root development. Refill planting hole, pressing lightly on the soil to remove any air pockets. Following one crop with another is called succession planting. This is a great way to maximize your vegetable harvest without expanding your garden. After your spring lettuce, you can plant heat loving crops such as tomatoes, peppers, eggplants, or bush beans. After these warm weather crops are finished, then follow up with cool-season greens such as lettuce or spinach. Find out how many frost free days you have in your growing season – i.e. 98 days. Add the number of days-to-maturity together for the crops you want to grow to see if your season is long enough. You may only have time for two crops – i.e. peas followed by a fall crop of lettuce. Please note you may have to add as much as 2 to 3 weeks to the days-to-maturity given to compensate for the declining light and cooler temperatures in the fall. Yes, by rotating your crops, it makes it easier to maintain soil fertility. Different crops remove different amounts of various minerals from the soil. To keep soil fertile, you have to see how each crop affects the soil. Crops can be heavy feeders, light feeders or soil builders. Heavy feeders include tomatoes, broccoli, beets, eggplant, cabbage corn, lettuce and other leafy vegetables. Light feeders include garlic, onions, peppers, potatoes, turnip, Swiss chard, sweet potatoes and radishes. Soil builders include peas, beans, and cover crops such as clover. To maintain soil productiveness, alternate heavy feeders with either light feeders or soil builders. Yes, especially if you add plenty of compost in the spring and/or fall to ensure the nutrients are replaced. Try planting soil builders such as clover or hairy vetch after pulling up your heavy feeding crops. Dig the residue into the soil in the spring. Add before you plant. When preparing a new garden bed, spread a thick layer of compost, well-rotted manure or other organic matter. Then add a new layer of organic matter every spring after that. Apply mulch. Once the soil warms up and crops are in place and growing, spread a layer of organic mulch such as dried grass clippings, straw or chopped leaves. Dig in at end of season. Once the crop is finished, dig in the mulch and the crop residue into the soil (unless it is diseased). Crops such as peas and beans add beneficial nitrogen to the soil. Plant a cover crop. Sow an annual cover crop like clover or hairy vetch to protect over the winter, control weeds, and to add more organic matter. Dig it into the soil in a few weeks before planting in the spring. Weekly watering with a diluted solution of fish emulsion or compost tea should keep container crops flourishing. Your local garden center is a great resource so you can ask for their recommendations on fertilizers. Yes, only if the weeds have not yet gone to seed. Perennial weeds are known for re-sprouting, so they are best thrown away or you can dry them completely in the sun before using them as mulch. What does finished compost look like? Finished compost is dark and crumbly. The original ingredients should be almost unrecognizable. Some lumps in the compost are alright if you plan to work it into the soil. Otherwise, you can return the large lumps or pieces to the compost pile for further decomposition. Frequent water that only gets the soil wet an inch or so on the surface is not necessary the best practice because it encourages shallow roots and that makes the plant vulnerable to heat and dry spells. For best results, water long enough so that the water penetrates at least 4 inches (10cm) into the soil; this is approximately 1 inch (2.5cm) of applied water. Soaker hoses offer an easy and efficient alternative to deliver water to plants. The following provides general watering guidelines but for more concise information, please consult the specific variety. WATERING GUIDELINESAlthough the standard watering recommendation is 1 inch (2.5cm) of applied water per week, sometimes depending on the conditions, you will need more or less. Remember, too much water is just as detrimental to the plant as not enough. The soil surface is covered with organic mulch. The soil has been amended with compost. The weather is cool and humid. They are grown in raised beds. They are grown in containers. When the containers are small and when weather is hot, you may be required to water once or twice a day. It is windy – especially dry wind. The weather is warm and dry. What’s the best way to keep aphids and spider mites off my vegetable plants without using insecticides? The easiest and most effective control for aphids and spider mites is to blast them off with a strong stream of water. Ladybugs are beneficial insects which feed on these garden pests. If you are unsure of the pest, contact your local garden center for guidance.